Redshift Rendering Technologies has introduced a new benchmarking utility for Redshift, its GPU-based production renderer. 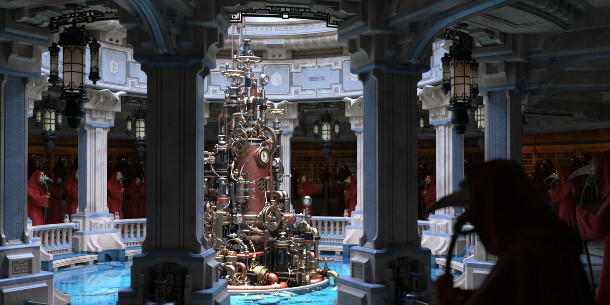 The benchmark, which is built into the current alpha release, should work with the 3ds Max, Cinema 4D and Houdini editions of the software, and – with a little tweaking – on Windows, Linux and macOS. The ‘Vultures’ benchmark is based on a complex production-quality scene with both hard-surface models and organic characters (above). It’s a Redshift .rs file, so it should work with any host DCC software. The benchmark utility is available as part of the current 2.5.19 alpha builds of the software, although it currently takes a bit of tweaking to make it work on Linux or the new macOS versions of Redshift. You can find more details in this thread on Redshift’s forum. Future Linux and macOS builds of the renderer should also be able to run the benchmark utility out of the box. Redshift users have already begun to post benchmark results, which you can see in a list here. As you might expect, GPUs with higher raw compute performance and/or more graphics RAM render the scene faster; and performance scales roughly linearly with the number of GPUs used. The CPU has limited influence, particularly CPU thread count, though a very low CPU clock speed can prove a performance bottleneck: Redshift recommends a 3.5GHz chip or higher. It’s also interesting to compare results from workstation and gaming cards: at the minute, the fastest single and dual-GPU scores are from Nvidia’s top-of-the-range workstation card, the Quadro GP100. However, the much less expensive Titan X Pascal and GeForce GTX 1080 Ti gaming cards aren’t far behind: the difference in performance looks to be in the range of 5-15%. And obviously, given that Redshift is a CUDA renderer, there are no scores for AMD cards. The benchmark utility is available as part of the latest Redshift 2.5.19 alpha builds. At the time of posting, it isn’t in the free trial edition, but the developers plan to add it to the next release.